Win $700 In 7 Days! UPDATE: We have a winner in my $700 in 7 Days Giveaway … yep, ‘barbaramontgom’ (with 6 points) was chosen by random drawing (see below) and wins the entire $700 Cash!!!!!! 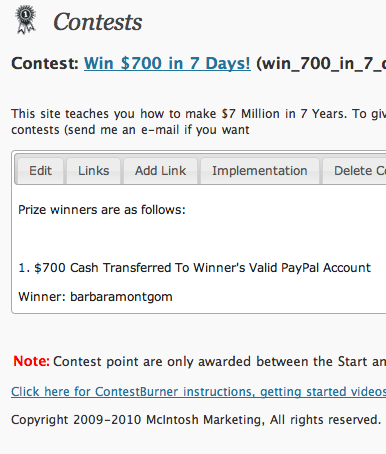 Barbara just needs to send me an e-mail ajc [at] 7million7years [dot] com to claim her $700 cash prize (less any PayPal fees)! Special thanks to Steve and Trisha who tied at the top of the leader board … if you send me an e-mail with your name/mailing address I will send each of you a $60 Apple Gift Card! Thanks to all of the others who entered and promoted the contest like crazy! LAST CHANCE to enter my free contest: CONTEST OVER: in just ONE more today, I am giving away $700 cash to one lucky reader (drawn at random) as part of my $700 in 7 Days No Strings Attached promotion. It’s free to enter simply by clicking here. I am giving away $700 cash to one lucky reader. There are NO CATCHES other than I will only pay by transfer from my PayPal account to yours. The contest is entirely free to enter … NO gotchas! So, why am I simply throwing away $700 cash? 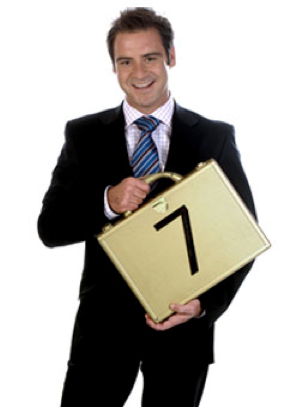 Well, I like the number ‘7’ (this site is called $7 million 7 years) … but, it’s really to test an idea that I have for my new startup venture! I do a lot of “off the wall” stuff on this site, and I like to share what I’m up to with my readers. This time, I want to see how many people join, what the referral sources are, and how active various readers are in promoting this contest, and so on. My experiment is your gain … all you need to do is ENTER for your chance to win $700 cash in just 7 days, when I announce the winner exactly one week from today! Who knows, it might even be you! Optional: For even more chances to win, get your links (below) and promote the contest to earn more points (each point = 1 entry). You can promote via Twitter, Facebook, Youtube, and you are even rewarded with more points (‘points’ = more chances to win) for leaving comments here. Rules: there are none, except that I will only pay by transfer from my US PayPal account to yours (it’s up to YOU to make sure that you can accept payments via PayPal from the USA). This is the world’s easiest contest. Simply enter for your chance to win. Optional: Spread the word for even more chances to win. And, help a new experiment in social marketing while you’re at it! This entry was posted in money and tagged contest by Adrian. Bookmark the permalink. Congratulations to barbaramontgom on her win in this fun contest.Congratulations to Trisha on her win of $60 Apple Gift Card! and thanks to Adrian for bringing us this fun contest. I think I can Speak for just about everyone when I say it was extremely fun.